Purex Laundry Detergent provided me with Purex coupons in exchange for sharing the Purex Make-A-Wish Campaign. However, all the opinions expressed here are mine. I'm super excited to share some news and a giveaway with you today. Everyone is familiar with Make-A-Wish and the wonderful work they do with ill children. What I didn't know, though, is just how much work they do - a wish is granted every 38 minutes and in 2013 over 14,000 wishes were granted. And almost all the funds for these wishes (costing an average of $8,141) come from corporate and individual donations - that's $8141 x 14000 ... a whole lot of money. For more information on Make-A-Wish and the wishes asked for and granted visit their website at wish.org (bring a tissue ... the sweet kids and their wishes ... ). I'm thrilled to share that Purex is giving $.05 to Make-A-Wish for the first 4 million bottles of 75oz+ liquid detergent sold from February 1 – February 28, 2014, and will increase the payment to $.10 for every bottle above 4 million, with a minimum guarantee of $200,000 up to a maximum of $300,000 and $.08 to Make-A-Wish for the first 620,000 bottles Classic and Ultra Lines in Mountain Breeze and Lavender fabric softeners sold from February 1 – February 28, 2014, and will increase the payment to $.10 for every bottle above 620,000, with a minimum guarantee of $50,000 up to a maximum of $100,000. More information can be found on the Purex website. Follow Purex on facebook as well. I purchased Purex Liquid Detergent a few months ago when there was an incredible deal on it at a local store. Normally I make my own powdered detergent and that's all well and good, but I don't think homemade is the way to go for really dirty clothes, especially camping clothes, and absolutely not the way to go for campfire scented clothes - they come out smelling a lot like when they went in. Hence the Purex purchase (and it was an incredible deal). I have to say I've been quite impressed. The clothes smell good - no more aroma-de-campfire smoke, the campsite clothes come out looking as if they'd never been camping, and everything feels good. While Purex is less expensive than other brands it works just as well, there's absolutely no reason at all to spend more. I will admit I had to read the Purex cap closely to figure out how much detergent to use, because it required much less per load than some of the other big brand detergents - as a happily frugal Mama I appreciated that, knowing the bottle would last longer. And now the giveaway: I will be giving away (1) coupon for a free bottle of Purex Mountain Breeze detergent to 2 different winners, so you've got two opportunities to win! Good luck. 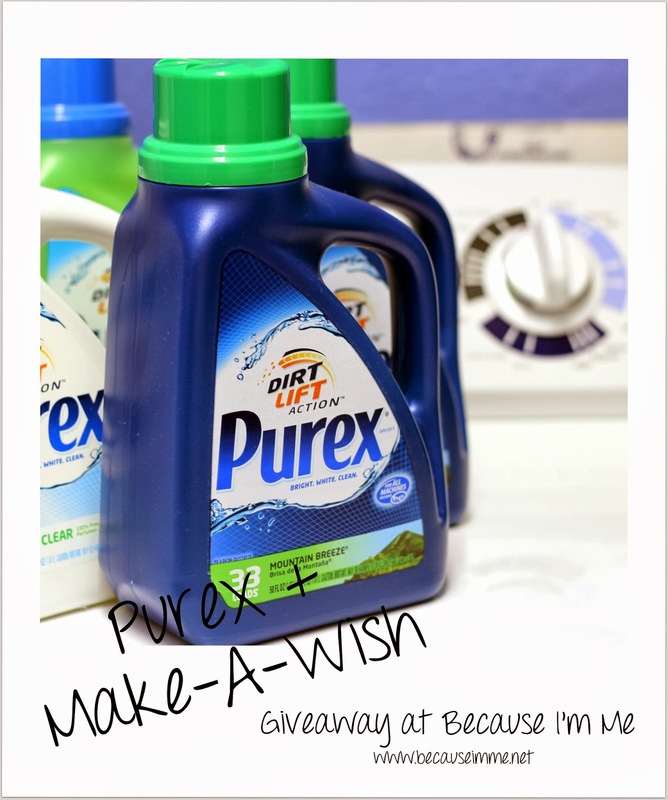 Please share this giveaway and great Purex promotion, and stock up on Purex - the more Purex buyers this February the better for Make-A-Wish and the kids and families they bless with wishes. Every bottle sold will help Make-A-Wish reach their so-important goal of being able to grant every wish requested of them. I have tried Purex, I love it! Yes, we use Purex all the time. We currently use the mountain breeze scented purex liquid detergent. Yes, Purex is the only detergent we use. Yes.... I have used Purex. I have used Purex in the past - would love to try it again! I don't think I have ever tried Purex. If so, it was a long time ago.